Because I felt like the tofu was going to have stronger flavors, I wanted a hint of sweetness with the couscous so I went with dried figs. I love how dried figs can really impart the hint of sweet but also added texture. I'm all about texture when it comes to putting together a dish. I mean, who wants one texture? Not this girl. In a blender or food processor, combine all ingredients except for tofu. Then pour mixture over the tofu and allow to marinate 1 hour or overnight. Remove tofu from the marinade (reserve for the couscous) and bake at 400 degrees for approximately 15-20 minutes, flip and continue to bake until browned. In a medium pan bring water to boil then add in the couscous and dried figs and reduce to a simmer. Cook 10-12 minutes. Stir in lemon juice, marinade, salt, red pepper flakes and cashews. Remove from heat then add in some chopped fresh mint. zucchini, squash, eggplant (or any veggies of your choosing) - simply cube veggies to even sizes, toss in small amount of olive oil, salt, pepper and bake or grill until tender. 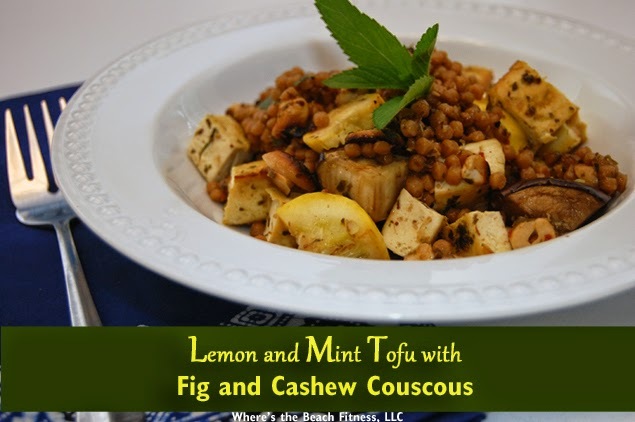 To assemble the dish, combine veggies with couscous and cubed tofu. Serve warm or room temperature. I think this turned out really well. There were no leftovers I can say that much. 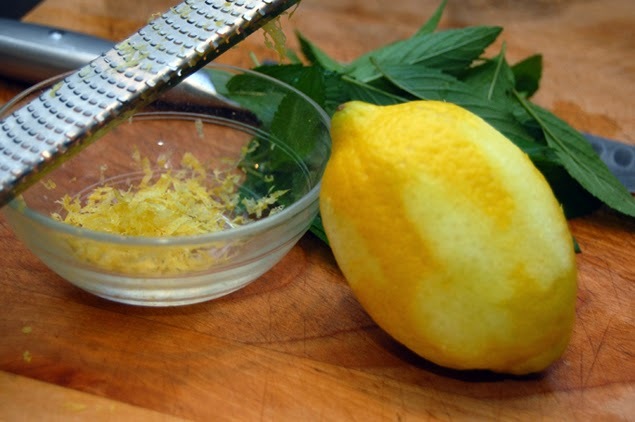 The lemon and mint marinade wasn't quite as strong as I had expected or perhaps intended, but it had a nice freshness to it. I loved the textures of the couscous - the chew from the dried figs and slight crunch from the cashews made my mouth happy. What's great about this dish is that you can use any grilled or roasted veggies you prefer (or have leftover). You can also add feta or goat cheese if you wish for a salty, tangy punch. And, for a bit of nutritional info about mint, it's actually rich in many vitamins and minerals such as magnesium, copper, iron, potassium, and calcium. Are you a fan of mint? What's your favorite way to use it?